Choose the size that fits your space. The ActivePlus 12 ft. TidalFit with Dual Swim Jets is the perfect size spa to fit in small spaces. This TidalFit offers the Quad Swim Jet System, DirectFlow® Hydrotherapy and a semi in-ground option. This 15 ft. Tidalfit has the same features as the 14 ft. Premium model plus a twin bench option. Get ideas on how to design your backyard or indoor area for your TidalFit. View photos of TidalFit Exercise Pool installations. See TidalFit's debut on ABC's Extreme Makeover Weightloss Edition and how exercise in the pool transformed a life. Each TidalFit model has its own unique swim system. To maximize your workout in your exercise pool you can add one or both of our Stationary Resistant Swim Tether and Rowing Bars + Resistant Cords. Every TidalFit model offers a Hydrotherapy option to relieve stress, soothe aching muscles and aid in relaxation. Artesian’s revolutionary Crystal AOP system, combines Nature2, Microfiltration, 24 Hour Water Circulation, Germicidal UV Light, Ozone and the ProPure Mixing Chamber to create the most advanced oxidation process for water purification. 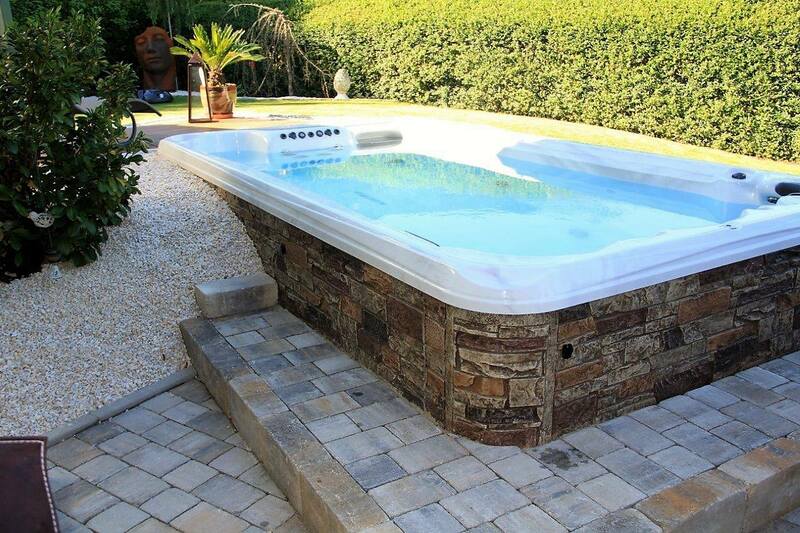 The TidalFit AcitvePlus EP12, Premium EP14 and Pro EP15 offer the semi in-ground pool option. This innovative technology provides you with the ultimate hydrotherapy control.